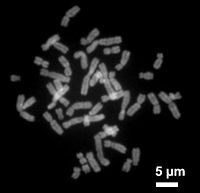 ^ Gill BS, Kimber G. The Giemsa C-banded karyotype of rye. Proc. Natl. Acad. Sci. U.S.A. April 1974, 71 (4): 1247–9. PMC 388202. PMID 4133848. doi:10.1073/pnas.71.4.1247. ^ Kato A, Lamb JC, Birchler JA. Chromosome painting using repetitive DNA sequences as probes for somatic chromosome identification in maize. Proc. Natl. Acad. Sci. U.S.A. September 2004, 101 (37): 13554–9. PMC 518793. PMID 15342909. doi:10.1073/pnas.0403659101. ^ Ellison, W. A study of the chromosome numbers and morphology in certain British varieties of the common cultivated potato (solanum buberosum L.) (PDF). Genetica. 1935, 17 (1): 1–26 [2008-05-11]. doi:10.1007/BF01984179. ^ Kenton A, Parokonny AS, Gleba YY, Bennett MD. Characterization of the Nicotiana tabacum L. genome by molecular cytogenetics. Mol. Gen. Genet. August 1993, 240 (2): 159–69. PMID 8355650. doi:10.1007/BF00277053. ^ Leitch IJ, Soltis DE, Soltis PS, Bennett MD. Evolution of DNA amounts across land plants (embryophyta). Ann. Bot. 2005, 95 (1): 207–17. PMID 15596468. doi:10.1093/aob/mci014. ^ Umeko Semba, Yasuko Umeda, Yoko Shibuya, Hiroaki Okabe, Sumio Tanase and Tetsuro Yamamoto. Primary structures of guinea pig high- and low-molecular-weight kininogens. International Immunopharmacology. 2004, 4 (10-11): 1391–1400. doi:10.1016/j.intimp.2004.06.003. ^ Vitturi R, Colomba MS, Pirrone AM, Mandrioli M. rDNA (18S-28S and 5S) colocalization and linkage between ribosomal genes and (TTAGGG)(n) telomeric sequence in the earthworm, Octodrilus complanatus (Annelida: Oligochaeta: Lumbricidae), revealed by single- and double-color FISH. J. Hered. 2002, 93 (4): 279–82. PMID 12407215. doi:10.1093/jhered/93.4.279. ^ 12.0 12.1 De Grouchy J. Chromosome phylogenies of man, great apes, and Old World monkeys. Genetica. 1987, 73 (1-2): 37–52. PMID 3333352. ^ Houck ML, Kumamoto AT, Gallagher DS, Benirschke K. Comparative cytogenetics of the African elephant (Loxodonta africana) and Asiatic elephant (Elephas maximus). Cytogenet. Cell Genet. 2001, 93 (3-4): 249–52. PMID 11528120. doi:10.1159/000056992. ^ Wayne RK, Ostrander EA. Origin, genetic diversity, and genome structure of the domestic dog. Bioessays. 1999, 21 (3): 247–57. PMID 10333734. doi:10.1002/(SICI)1521-1878(199903)21:3 (不活跃 2009-03-11). ^ Burt DW. Origin and evolution of avian microchromosomes. Cytogenet. Genome Res. 2002, 96 (1-4): 97–112. PMID 12438785. doi:10.1159/000063018. ^ Ciudad J, Cid E, Velasco A, Lara JM, Aijón J, Orfao A. Flow cytometry measurement of the DNA contents of G0/G1 diploid cells from three different teleost fish species. Cytometry. 2002, 48 (1): 20–5. PMID 12116377. doi:10.1002/cyto.10100. ^ Yasukochi Y, Ashakumary LA, Baba K, Yoshido A, Sahara K. A second-generation integrated map of the silkworm reveals synteny and conserved gene order between lepidopteran insects. Genetics. 2006, 173 (3): 1319–28. PMID 16547103. doi:10.1534/genetics.106.055541. ^ Smith J, Burt DW. Parameters of the chicken genome (Gallus gallus). Anim. Genet. 1998, 29 (4): 290–4. PMID 9745667. doi:10.1046/j.1365-2052.1998.00334.x.